(NewsUSA) - Sponsored News - For anyone who ever wished for an easy way to take a beverage on the go, a GenieBag will grant that wish. At first glance, a GenieBag looks like a designer handbag. But the unique design of GenieBags allows them to serve as stylish, discreet, and effective beverage carriers. For situations where it's difficult to bring a drink, such as taking your wine to the ballpark, concert, or movie theater, a GenieBag can be the solution. Another scenario in which a GenieBag might be helpful: if you want to add a shot of vodka to your iced tea at a summer party. The bags currently feature three styles: Cosmo, NY Nights, and Pino. Each can hold two liters of the beverage of your choice in a discreet, safe, subtle carrier that can go from a casual summer baseball game to an elegant concert to a party at a friend's house. Entrepreneur Beth Walters targets several demographics, including busy moms, professionals looking to relax on the weekends, and friends gathering to catch up. The GenieBags team has learned that women love the look of the handbags, but are also impressed with both the concept and the practicality. The business started with a few key people creating prototypes for the bags, which are available in three styles and three colors. Demand is increasing, and the company has listed www.geniebags.com at the crowdfunding site: www.fundable.com/geniebagscom. At the site, GenieBags can be preordered for 30 percent off the original retail price, and orders will be fulfilled as soon as possible once financing is secure. 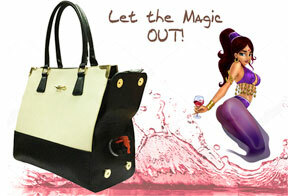 GenieBag handbags are designed for fun and convenience. The distinctive, discreet design allows anyone to pull out a glass or two and share a drink without bothering anyone or making a scene. You and a few friends can enjoy your Chardonnay, Pinot Noir, any other favorite with ease. To learn more and assist with the development of new products for the current GenieBags product line, visit the crowdfunding site www.fundable.com/geniebagscom. GenieBags.com is in the philanthropy business, too. A portion of all sales go to disabled vets and others in need through a relationship with the Gift of Health Foundation.